Mateus Carneiro in the neutrino lab worrying about meson exchange currents. 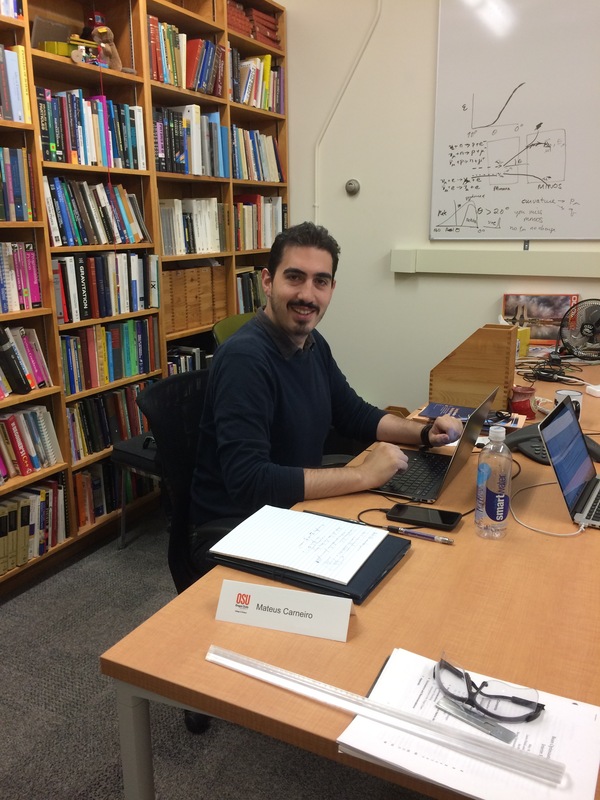 Please welcome Mateus Fernandes Carneiro who has joined the Schellman neutrino group as a postdoctoral scholar. Mateus just completed his dissertation “Measurement of Muon Neutrino Quasi-Elastic Scattering on a Hydrocarbon Target at Enu of 6 GeV” at the Centro Brasileiro de Pesquisas Fisicas using the MINERvA neutrino detector at Fermilab. He will be working with Heidi Schellman and Amit Bashyal on studies of neutrino cross sections. Mateus will be working from Fermilab most of the time but will visit us frequently.